Happy New Year, there are many changes on the horizon and I encourage you to send you comments and criticisms directly to me. I can’t improve the site/newsletter without your suggestions. Over the last couple of months, I have repeatedly discussed the deterioration of market breadth, momentum and the fundamental backdrop of the markets. “As always, your portfolio, much like a garden, must be tended too in much the same way. By doing so, it will ensure that it prospers and grows over time and yields a fruitful bounty. My colleague Dana Lyons penned a very good piece earlier this week that dovetails with my own analysis. 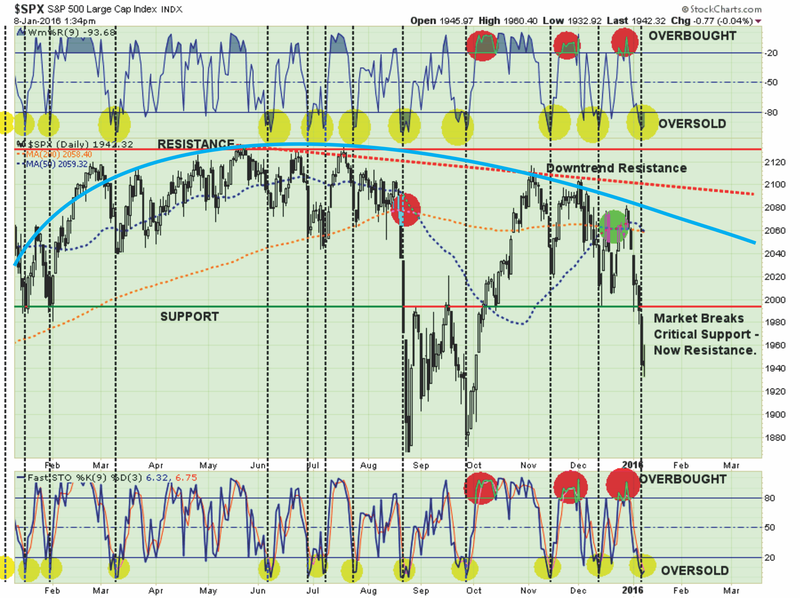 “In reality, there are only a relatively few number of really key days in the market. These days are easily identified in hindsight, though, at times, we can sense their possible importance in real time (e.g., July 20 and August 24.) We bring this up because today had the potential makings of a key day in the stock market, in our view. He is absolutely correct. While the media focuses on day-to-day news flow to try and assess a reasoning behind daily market gyrations, for long-term investors it is only the “trend of prices” that matter. Before I show you my analysis, take a look at Dana’s. The two charts below are of the same Value Line index. The only difference is how the indices are measured. The first is the GEOMETRIC composite index and the second is the ARITHMETIC composite. The index, as noted, is very broad by tracking more than 1700 stocks. What is important, is that for the first time since the lows of 2009, the index is breaking the bullish trend that has prevailed during that time. If we step back and look at this index going back to 1998, we can see what has happened previously when price trends changed direction. Notice that when the “trend” of the market has changed from positively sloping to negatively sloping, it has not been a good time to be heavily allocated to “equity risk” exposure. Could this be a “false flag”, a “head fake”, or simply an “overreaction” that rights itself in short order with a resumption of the “current bull market.” Yes, it could be. However, there are other indications that suggest that the current correction may be different than previous “buy the dip” opportunities much like the decline in 2011 turned out to be. Since the turn of the century, the two primary moving averages have only crossed three other times – at the peak of the markets in 2001 and early 2008, and in 2011.The difference in 2011 is that while the sharp decline in the prices due to the debt ceiling debate caused the moving averages to cross, the two lower sell signals were not triggered. This kept portfolios allocated more towards equities at that time. “I now feel even more certain that debt-driven asset bubble implosions (such as the GFC) cannot merely be ‘fixed’ with even more debt and another round of central bank-driven asset bubbles. Policy since the GFC has resulted in a deeply unstable outcome in the global economy and across markets. Alan Greenspan and US legislators addressed the early 2000s debt-driven asset bubble collapse (primarily in corporate equities) by driving another round of debt-driven asset bubbles (primarily in housing and the financial sector). And we know how that ended! The chart below is a VERY long-term look at the S&P 500 going back to 1965. It is a monthly analysis of changes in price momentum and long-term moving average support. The vertical orange lines are when SELL signals were issued as both momentum turned negative and prices violated the long-term moving average. Conversely, the vertical blue lines are BUY signals when market dynamics reversed to the positive. Currently, the markets are registering the first confirmed set of monthly SELL signals since the peak of the market in late 2007. With all of the alarm bells currently triggering, the initial “emotionally” driven response is most likely an urge to go look at your portfolio statement and start pushing the “sell” button. Don’t Do It! When working with technical analysis, particularly long-term views, by the time a “signal” is triggered, the short-term market move is already well advanced. On a short-term basis, prices oscillate back and forth like a rubber band be pulled and let loose. Physics state that a rubber band stretched in one direction, will initially travel an equal distance in the opposite direction when released. In particular note the top and bottom portions of the chart. These two indicators measure the “over bought” and “over sold” conditions of the market. As with the rubber band example above, you will notice that when these indicators get stretched to the downside, there is an effective “snap back” in fairly short order. With the markets having issued multiple sell signals, broken very important support and both technical and fundamental deterioration in progress, it is suggested that investors use these “snap back” rallies to reduce equity risk in portfolios. While Technology, Industrials, Financials, Basic Materials, and HealthCare stocks have shown better performance than the index as a whole, these sectors are only winning by not losing as much. Adding to fixed income, not high-yield bonds, is advisable here as markets continue to see a flight to safety. Hold current allocations for now and add to positions when the equity market bounces. As we enter the New Year, I have set the SARM Model to reflect the allocation model discussed above and below. With the pullback this week, the markets are oversold enough once again to elicit a short-term rally over the next week or so. As you will notice, the model is currently carrying 35% cash in the portfolio. Any rally in the markets should be used to reduce cash and increase fixed holdings accordingly. As discussed above, the market has fallen to the long-term trend support and is threatening to violate that trend. A change in TREND is critical and suggests that the bull market advance that began in 2009 is over. As shown in the chart above, the technical deterioration is significant. The 401k Model is NOT being tactically adjusted at this time because the markets are VERY OVERSOLD on a short-term basis. Over the next week or so the markets will likely rally to previous resistance at 1990 on the S&P 500. This level should be used to reduce portfolio equity risk to the current model levels.